Following a long day on Kauai that started with a 4:30 a.m. wakeup and continued pretty much nonstop through sunset, I’m not sure why I thought it would be a good idea to extend my day further, especially given that we had another 4:30 a.m. wakeup set for the next day. But there I was, picking my way alone across the wet sand in pitch dark. 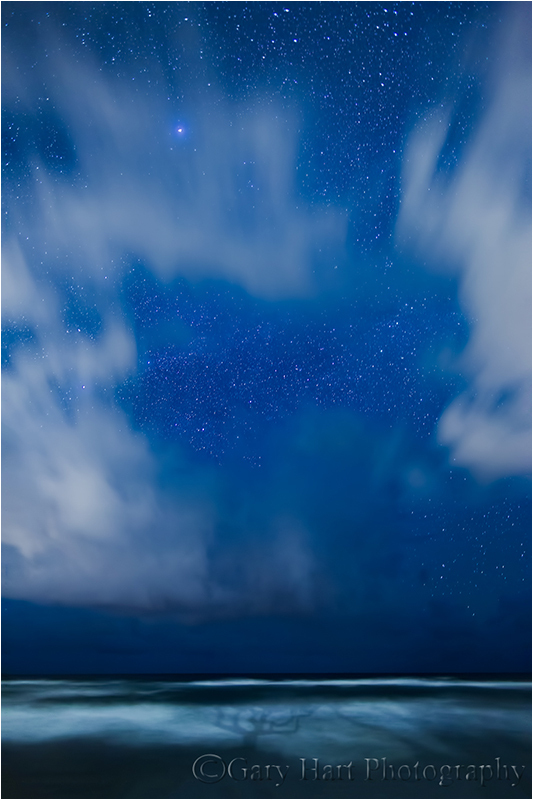 I’d wanted to do some night photography on this Kauai visit but had been thwarted by clouds the previous nights. On this night, however, the clouds held back and when I hit the beach it felt like ten thousand stars rushed to welcome me. Living my entire life in areas of light pollution, camera or not I’m always moved by the sight of a truly dark sky. A few thin clouds mingled with the stars, but they were clearly no match for the legions of stars—what could possibly go wrong? I made my way north along the beach searching something for my foreground. With no moon, the darkness was pretty complete, but once my eyes adjusted I found the easiest going right along the water line, where I could use contrast of the shifting line of lapping surf to keep me on course. Every once in a while a warm wave would wash up and clean the sand from my between my toes. After a couple hundred yards I came upon a few chunks of wave-worn basalt protruding from the surf and decided I needed to go no further. Exposures between 15 and 30 seconds not only smoothed the waves, they also created a pleasing motion blur in the clouds. I tried a variety of compositions with no illusions I’d get anything special—I just welcomed the excuse to be alone with the stars on a warm Kauai beach. In fact, I was having so much fun that I wasn’t really paying attention to the fact that each frame contained a little less sky and a little more cloud. The image you see here was one of my last captures. Shortly after clicking it the wind kicked up—spend any time in Hawaii and you learn that a sudden increase in the wind usually means rain isn’t far behind. I looked up. Hmmm. The stars were about gone—when did that happen? While collapsing my tripod a large raindrop slapped my cheek, then another on my leg. Soon the drops were pelting me and the sand like bullets on Omaha Beach. Getting caught in the rain in Hawaii isn’t nearly as unpleasant as it is most other places (go figure), but Hawaii rain is just as wet as any other rain and I’d gone out with just my camera, one lens, and tripod—sans camera bag I was without rain gear for myself and had nothing to protect my camera (I never claimed to be smart). I hustled a short distance further up the beach to what I thought would be a shortcut through the condo community situated just above the beach but was blocked by a creek emptying into the ocean—in daylight this wouldn’t have been much of an obstacle, but trying to negotiate rocks and water in the dark wouldn’t have been wise (having already lost one camera to a Hawaii creek this year). I considered scrambling up the hill, but separating me and the easiest route back was a twenty-foot wide, one-foot high groundcover of unknown composition. So I turned and sprinted back down the beach, mindful of the rocks I’d just photographed and suddenly aware that the tide and come in. Surprise number two (see “smart” comment above). My camera was getting a drenched, but to stumble in the dark would risk giving it a saltwater bath. I considered shoving my camera inside my shirt, but my shirt was about as dry as a bucket of water. Desperate, I looked for a path up the slope and through the ground cover separating me from the manicured lawn (and a quick, illuminated route to safety). Spying a possible gap, I darted into the brush. Dead end. But propelled by momentum and concern for my camera I didn’t break stride, leaping into the brush like Peter Rabbit into a briar patch. (Peter Rabbit I’m not, and I have the scratches to prove it.) Once onto the lawn it was only about a three minute dash back to the resort. It doesn’t rain like this in California—I’m pretty sure it would have taken a full day to accumulate the amount of rain I got in less than fifteen minutes that night on Kauai. Not only that, it usually takes about a day to build up to it, and then another day to decide it’s done. But of course my rain (it somehow felt personal) stopped right after I made it to the room, before I’d even stopped dripping and huffing. The next day, while reviewing the images on my computer, I was pleased to find a couple that might have more value than merely the excuse I needed to get out to play with the stars that night. Because it had been so dark while I was out there, it took me a few seconds to sort out the layers in my images, but what you see here, from bottom to top, is the dark, wet sand on which I stood; the white surf washing up on the beach in front of me; an area of dark, calmer water; more waves where the surf hits a volcanic shelf less than 100 yards from shore; a thin stripe of open ocean; and finally sky, clouds, and stars. The real treat in this image is the unexpected shadow of a tree painted on the nearby surf, cast I’m guessing by the faint light from the condos behind me. I’d love to say this shadow and its perfect position against the white surf was part of my plan, but it wasn’t. Not only did the motion in the surf, which shifted continuously between dark-calm and white-waves, create a constantly changing background, it was just too dark out there for my eyes to register the shadow anyway. But my camera, with its ability smooth motion and absorb more light than my eyes can, gave me something invisible to my eyes. And this ability to capture reality that my eyes miss really is my favorite thing about photography. I love your blogs. They are both informative and greatly entertaining. Keep them coming! Thanks, Charlie. This was with my Zeiss prime, which doesn’t have autofocus. To focus with this lens at night (which is pretty much the only time I use it), I live-view focus on a bright star. And I just went with the settings that would give me the most light without too much star movement. I don’t like to go longer than 30 seconds for star images unless I want star trails, in which case I usually do at least 30 minutes. And I find ISO 3200 and below pretty manageable. I’ll go over 3200 if I need it, but I didn’t think I needed it here. Breathtaking image…can’t stop looking at it! And, it really makes me want to go back to Hawaii IMMEDIATELY!! Gary, I enjoyed the image even more after reading your blog about the night shoot. Having been to the Kauai Beach Resort, I was picturing in my mind the landmarks, like the ones you mentioned, as you tried to escape the rain. Very entertaining and enjoyable. Love the shadow of the tree in the surf. An image well worth a little drenching eh? Great story Gary.